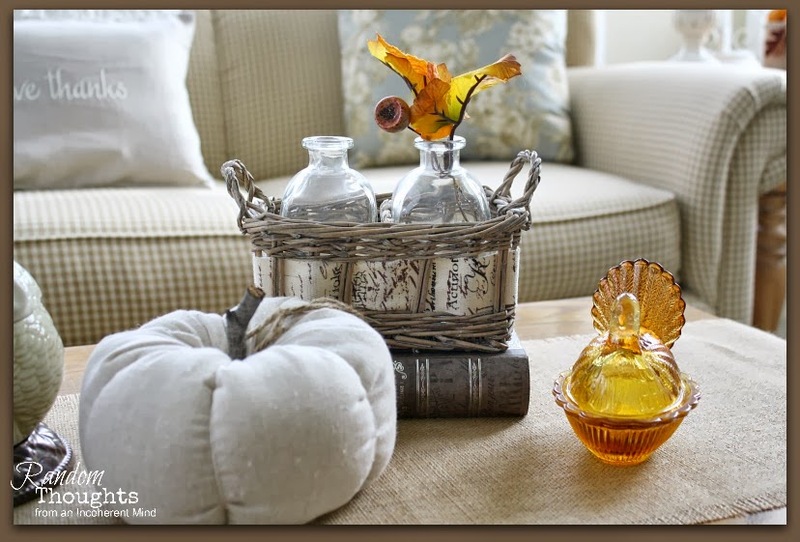 I'm sharing a coffee table vignette today and it's all about Thanksgiving. but I'm bound and determined to give Thanksgiving its due. Even if I'm listening to Christmas music as I type this. I really love Christmas music. Mostly everything I used in this vignette, I've had for years. from Joann Fabrics a couple of years ago. so why not spread a little Etsy love too? Joann Fabrics find a few years ago. The burlap runner was also an Etsy purchase. It's a great runner and I think it's the perfect base for my vignette. The Etsy shop can be found here. very talented Ann of On Sutton Place. Her Etsy shop can be found here. Very pretty Gina...I know I say it all the time but I love your couch! I love listening to Christmas music too, one of our radio stations started playing it on friday 24 hrs from now till Christmas! Your vignette is so sweet Gina. I must say I adore the pillow that Ann made. Love all your things you have put together. I am not going to rush the Christmas decorating to be here! The fireplace in our reno won't be done, so I am having a hard time getting into thinking about Christmas decorating. Oh well,,,,I am sure once all the blogs start posting I will get in the mood! Stop by my blog for a chance to will some hand made cards when you post a comment :) Have a great day! Very pretty. You found some great Etsy goodies. I love the pillow and the runner. The only Christmas things I have out are some recent thrift store finds... and of course some ornaments I'm working on. I love Christmas music too. AND they are calling for snow flurries here tomorrow... HERE in NC... not normal, needless to say, we are excited! I think it's ok to listen to Christmas music while decorating for Thanksgiving. I have a son who whistles Christmas music in the summer. I am such a Christmas nut too that I always wondered how I would do if I was having Thanksgiving in November. I know it is all about what you know but it has always made me wonder. Your living room looks great! 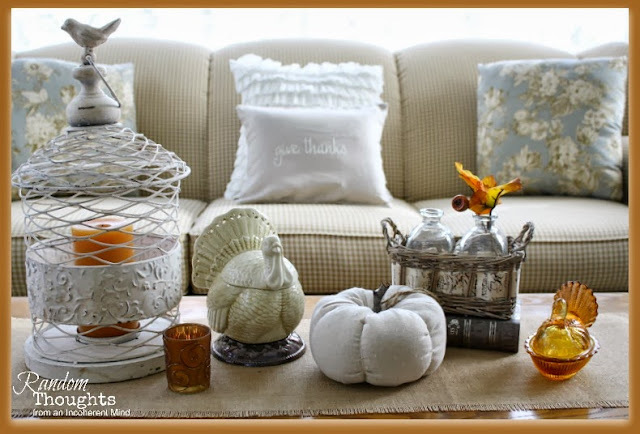 I'm going to decorate a little for Thanksgiving tomorrow. I need to order one of those pillows from Ann's shop. I do love them! 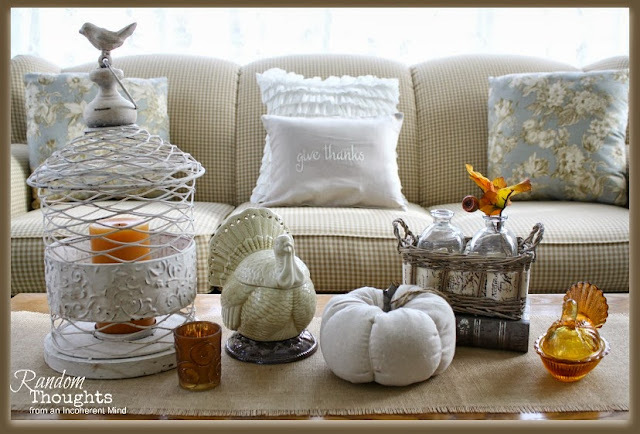 Really cute tablescape, and I really like that cute pillow! This is so pretty, Gina! I haven't even thought about Christmas with this reno going on. I'll be lucky to get a tree up! Love your vignette, Gina! So pretty! Great Estsy finds!I would love if you stop by and link this post to my weekly party that is live now.Great inspiration! 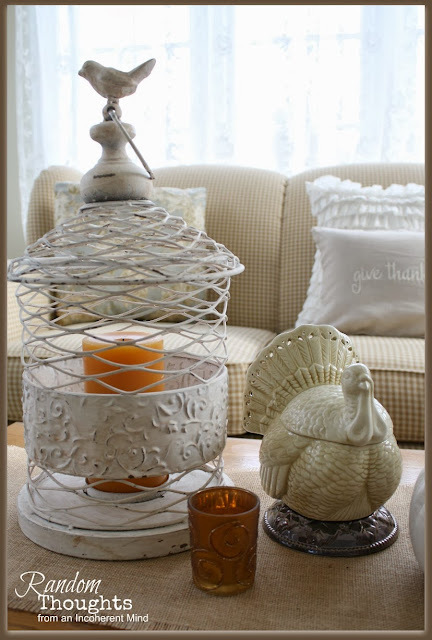 What a great Thanksgiving vignette! 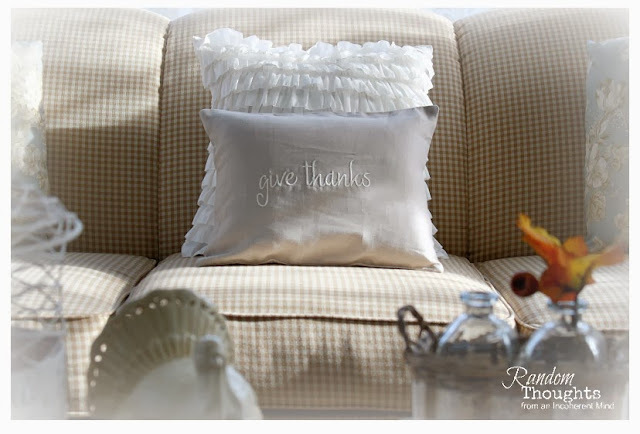 The give thanks pillow is a nice treasure to have! I'm thinking about Christmas decorating too. I actually listened to some music today! I always decorate after Thanksgiving so I can give the holiday it's due too! Lovely vignette! So many pretty items, but the birdcage is always a favorite! Your vignette is lovely, Gina! You always have the best ideas when arranging these! I love your pillow! I'm a Christmas music girl too! I love it all the time! Oh, thanks for the inspiration. I just moved from bottles from my birdcage and it is sitting empty. Now I know that I need to find a big candle or several small candles for it.